Supervac has designed a revolutionary system for septic applications. The JugglerTM is a unique patented pumping and liquid-solid separation system that services grease traps and septic tanks without requiring chemicals. This technology returns a liquid that is almost free of solids, being safe for the bacterial flora if discharge into nature. Paring this unit with a custom built truck to meet your business needs, the result will provide you with an equipment ready to successfully accomplish tasks in the roughest conditions. 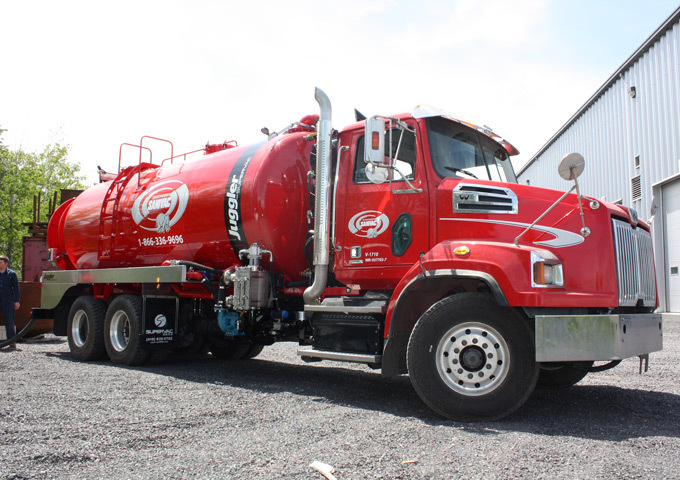 Designed for the selective collection of septic tanks, Supervac's flagship unit makes it possible to return some of the liquid in the tank and collect 10 to 12 tanks before having to unload the tank. Let our automated collect and return of filtered liquid sequences do the work for you! Avoid stoppages and breakage with our pre-filter recovering solid contaminants (e.g. wipes) that could clog the main filter. Supervac has a patent on TRITON technology, a unique centrifugal ultrasonic filtration system. All major functions are supported by remote control or automated optimizing your operators’ time and attention. The achieved goals are consistent, high quality results your customers demand and your operators are less fatigued at the end of the day! Diversify your revenue by offering the Grease Trap Collection service for catering, another option included with Juggler equipment. The Juggler™ is a unique, patented pumping and liquid-solid separation system that services grease traps and septic tanks, with no chemicals. This unit returns a liquid that is almost free of solids, without affecting the bacterial flora.